For other people named Henry St. John, see Henry St. John (disambiguation). Henry St John, 1st Viscount Bolingbroke. Attributed to Alexis Simon Belle, c. 1712. (NPG 593 at the National Portrait Gallery, London). Henry St John, 1st Viscount Bolingbroke (/ˈsɪndʒɪn ˈbɒlɪŋbrʊk/; 16 September 1678 – 12 December 1751) was an English politician, government official and political philosopher. He was a leader of the Tories, and supported the Church of England politically despite his antireligious views and opposition to theology. He supported the Jacobite rebellion of 1715 which sought to overthrow the new king George I. Escaping to France he became foreign minister for the Pretender. He was attainted for treason, but reversed course and was allowed to return to England in 1723. 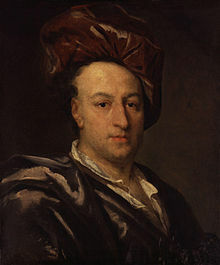 According to Ruth Mack, "Bolingbroke is best known for his party politics, including the ideological history he disseminated in The Craftsman (1726–35) by adopting the formerly Whig theory of the Ancient Constitution and giving it new life as an anti-Walpole Tory principle." Henry St John was most likely born at Lydiard Tregoze, the family seat in Wiltshire, and christened in Battersea. St John was the son of Sir Henry St John, 4th Baronet later 1st Viscount St John, and Lady Mary Rich, daughter of the 2nd Earl of Warwick. Although it has been asserted that St John was educated at Eton College and Christ Church, Oxford, his name does not appear on registers for either institution and there is no evidence to support either claim. It is possible he was educated at a Dissenting academy. He travelled to France, Switzerland and Italy during 1698 and 1699 and acquired an exceptional knowledge of French. St John made friends with the Whigs James Stanhope and Edward Hopkins and corresponded with the Tory Sir William Trumball, who advised him: "There appears indeed amongst us [in England] a strong disposition to liberty, but neither honesty nor virtue enough to support it". Oliver Goldsmith reported that he had been seen to "run naked through the park in a state of intoxication". Swift, his intimate friend, said that he wanted to be thought the Alcibiades or Petronius of his age, and to mix licentious orgies with the highest political responsibilities. In 1700, he married Frances, daughter of Sir Henry Winchcombe of Bucklebury, Berkshire, but this made little difference to his lifestyle. He became a Member of Parliament in 1701, representing the family borough of Wootton Bassett in Wiltshire, as a Tory. His seat was Lydiard Park at Lydiard Tregoze, now in the Borough of Swindon. He attached himself to Robert Harley (afterwards Lord Oxford), then speaker, and distinguished himself by his eloquence in debate, eclipsing his schoolfellow, Robert Walpole, and gaining an extraordinary ascendancy over the House of Commons. In May, he had charge of the bill for securing the Protestant succession; he took part in the impeachment of the Whig lords for their conduct concerning the Partition treaties, and opposed the oath of loyalty against the "Old Pretender". In March 1702, he was chosen commissioner for taking the public accounts. After Queen Anne's accession, St John supported the bills in 1702 and 1704 against occasional conformity, and took a leading part in the disputes which arose between the two Houses. In 1704, St John took office with Harley as secretary at war, thus being brought into intimate relations with John Churchill, 1st Duke of Marlborough, by whom he was treated with favour. In 1708, he left office with Harley on the failure of the latter's intrigue, and retired to the country till 1710, when he became a privy counsellor and secretary of state in Harley's new ministry, representing Berkshire in parliament. He supported the bill for requiring a real property qualification for a seat in parliament. In 1711 he founded the Brothers' Club, a society of Tory politicians and men of letters, and the same year witnessed the failure of the two expeditions to the West Indies and to Canada promoted by him. In 1712, he was the author of the bill taxing newspapers. The refusal of the Whigs to make peace with France in 1706, and again in 1709 when Louis XIV offered to yield every point for which the allies professed to be fighting, showed that the war was not being continued in the national interest, and the queen, Parliament and the people supported the ministry in its wish to terminate hostilities. Because of the diversity of aims among the allies, St John was induced to enter into separate and secret negotiations with France for the security of English interests. In May 1712, he ordered the Duke of Ormonde, who had succeeded Marlborough in command, to refrain from any further engagement. These instructions were communicated to the French, though not to the allies, Louis putting Dunkirk as security into possession of England, and the English troops deserted their allies almost on the battlefield. Subsequently, St John received the congratulations of the French foreign minister, de Torcy, on the French victory over Prince Eugene at Denain (24 July 1712). Bolingbroke pictured alongside the earl of Oxford, together with a portrait of Francis Atterbury. Engraving after a painting by Sir Godfrey Kneller. In June 1712, St John's commercial treaty with France, establishing free trade with that country, was rejected by the House of Commons. The treaty was presented in the Commons by Arthur Moore as St John had been created Viscount Bolingbroke earlier that year. A major campaign was waged against its approval under the slogan "No Peace Without Spain". At least 40 or so from the Tories voted to reject the treaty. In August 1712, Bolingbroke went to France and signed an armistice between England and France for four months. Finally, the Treaty of Utrecht was signed in March 1713 by all the allies except the emperor. The first production of Addison's Cato was made by the Whigs the occasion of a great demonstration of indignation against the peace, and by Bolingbroke for presenting the actor Barton Booth with a purse of fifty guineas for "defending the cause of liberty against a perpetual dictator". Meanwhile, the friendship between Bolingbroke and Harley, the basis of the whole Tory administration, had been gradually dissolved. In March 1711, when the Marquis de Guiscard made an attempt on Harley's life, Bolingbroke assumed temporary leadership of the ministry's affairs. His difficulty in controlling the Tory back-benchers, however, only made Harley's absence the more noticeable. In May, Harley obtained the earldom of Oxford and became lord treasurer, while in July, St John was greatly disappointed at receiving only his viscountcy instead of the earldom lately extinct in his family, and at being passed over for the Order of the Garter. In September 1713 Jonathan Swift came to London and made a final vain attempt to reconcile his two friends. But now a further cause of difference had arisen. The queen's health was visibly breaking, and the Tory ministers anticipated their downfall on the accession of the Elector of Hanover. During Bolingbroke's diplomatic mission to France he had incurred blame for remaining at the opera while the Pretender was present, and according to the Mackintosh transcripts he had several secret interviews with him. Regular communications were kept up subsequently. In March 1714, Herville, the French envoy in London, sent to de Torcy, the French foreign minister, the substance of two long conversations with Bolingbroke in which the latter advised patience till after the accession of George I, when a great reaction was to be expected in favour of the Pretender. At the same time, he spoke of the treachery of Marlborough and Berwick, and of one Other (presumably Oxford) whom he refused to name, all of whom were in communication with Hanover. Both Oxford and Bolingbroke warned James Stuart that he could have little chance of success unless he changed his religion, but the latter's refusal does not appear to have stopped the communications. Bolingbroke gradually superseded Oxford in the leadership. Lady Masham, the queen's favourite, quarrelled with Oxford and identified herself with Bolingbroke's interests. The harsh treatment of the Hanoverian demands was inspired by him, and won favour with the queen, while Oxford's influence declined; and by his support of the Schism Bill in May 1714, an aggressive Tory measure forbidding all education by dissenters by making an episcopal licence obligatory for schoolmasters, he probably intended to compel Oxford to give up the game. Finally, a charge of corruption brought by Oxford in July against Bolingbroke and Lady Masham, in connexion with the commercial treaty with Spain, failed, and the lord treasurer was dismissed or retired on 27 July 1714. The Queen died four days later, after appointing Shrewsbury to the lord treasurership. On the accession of George I the illuminations and bonfire at Lord Bolingbroke's house in Golden Square were "particularly fine and remarkable", but he was immediately dismissed from office. The new king had been close to the Whigs but he was willing to bring in Tories. The Tories however refused to serve and gambled everything on an election, which they lost. The triumphant Whigs systematically removed the Tories from most of the posts nationally and regionally. Bolingbroke followed an erratic course that baffled his contemporaries and historians. He retired to Bucklebury and is said to have now written the answer to the Secret History of the White Staff accusing him of being a Jacobite. In March 1715, he in vain attempted to defend the late ministry in the new parliament; and on the announcement of Walpole's intended attack upon the authors of the Treaty of Utrecht he gave up. Bolingbroke fled in disguise to Paris—a major blunder. In an even greater blunder he joined the Pretender, was made Earl of Bolingbroke in the Jacobite Peerage, and took charge of foreign affairs in the Stuart court. The uprising of 1715 was badly botched and the death of Louis XIV meant the Pretender had lost his major sponsor; King Louis XV wanted peace with Britain and refused to endorse any further schemes. In March 1716, Bolingbroke switched sides again. He had lost his titles and property when Parliament voted a bill of attainder for treason. He hoped to recover the good graces of King George, and indeed managed to do so in a few years. He wrote his Reflexions upon Exile, and in 1717, his letter to Sir William Wyndham in explanation of his position, generally considered one of his finest compositions, but not published till 1753 after his death. The same year, he formed a liaison with a widow Marie Claire Deschamps de Marcilly, whom he married in 1720, two years after his first wife's death. He bought and resided at the estate of La Source near Orléans, studied philosophy, criticized the chronology of the Bible, and was visited amongst others by Voltaire, who expressed unbounded admiration for his learning and politeness. Henry St John, 1st Viscount Bolingbroke. Attributed to Charles Jervas. Engraving showing Dawley House, before Saint John's improvements. A mighty maze! but not without a plan;"
On the first occasion which offered itself, that of Pulteney's rupture with Walpole in 1726, he endeavoured to organize an opposition in conjunction with the former and Wyndham; and in 1727, began his celebrated series of letters to The Craftsman, attacking the Walpoles, signed "an Occasional Writer". He won over the Duchess of Kendal with a bribe of £11,000 from his wife's estates, and with Walpole's approval obtained an audience with the king. His success was imminent, and it was thought his appointment as chief minister was assured. In Walpole's own words, "as St John had the duchess entirely on his side I need not add what must or might in time have been the consequence", and he prepared for his dismissal. But once more Bolingbroke's "fortune turned rotten at the very moment it grew ripe", and his projects and hopes were ruined by the king's death in June. Henry St John retired in June 1735. He wrote additional essays signed "John Trot" that appeared in the Craftsman in 1728, and in 1730 followed Remarks on the History of England by Humphrey Oldcastle, attacking Walpole's policy. Comment prompted by Bolingbroke was continued in the House of Commons by Wyndham, and great efforts were made to establish the alliance between the Tories and the Opposition Whigs. The Excise Bill in 1733 and the Septennial Bill in the following year offered opportunities for further attacks on the government, which Bolingbroke supported by a new series of papers in the Craftsman styled "A Dissertation on Parties"; but the whole movement collapsed after the new elections, which returned Walpole to power in 1735 with a large majority. Bolingbroke retired baffled and disappointed from the fray to France in June, residing principally at the château of Argeville near Fontainebleau. He now wrote his Letters on the Study of History (printed privately before his death and published in 1752), and the True Use of Retirement. In 1738, he visited England, became one of the leading friends and advisers of Frederick, Prince of Wales, who now headed the opposition, and wrote for the occasion The Patriot King, which together with a previous essay, The Spirit of Patriotism, and The State of Parties at the Accession of George I, were entrusted to Pope and not published. Having failed, however, to obtain any share in politics, he returned to France in 1739, and subsequently sold Dawley. In 1742 and 1743, he again visited England and quarrelled with Warburton. In 1744, he settled finally at Battersea with his friend Hugh Hume, 3rd Earl of Marchmont, and was present at Pope's death in May. The discovery that the poet had printed secretly 1500 copies of The Patriot King, caused him to publish a correct version in 1749, and stirred up a further altercation with Warburton, who defended his friend against Bolingbroke's bitter aspersions, the latter, whose conduct was generally reprehended, publishing a Familiar Epistle to the most Impudent Man Living. In 1744, he had been very busy assisting in the negotiations for the establishment of the new "broad bottom" administration, and showed no sympathy for the Jacobite expedition in 1745. He recommended the tutor for Prince George, afterwards George III. About 1749, he wrote the Present State of the Nation, an unfinished pamphlet. Philip Stanhope, 4th Earl of Chesterfield records the last words heard from him: "God who placed me here will do what He pleases with me hereafter and He knows best what to do". He died on 12 December 1751, aged 73, his second wife having predeceased him by one year. They were both buried in St Mary's, the parish church at Battersea, where a monument with medallions and inscriptions composed by Bolingbroke was erected to their memory. He was succeeded in the title as 2nd Viscount Bolingbroke, according to the special remainder, by his half-nephew Frederick St John, 2nd Viscount Bolingbroke (a title granted to Bolingbroke's father in 1716), from whom the title has descended. Frederick was the son of the 1st Viscount's half-brother John St John, by his father's second wife Angelica Magdalena Pelissary. Bolingbroke, Georgia was named after him. In the late 20th century, Bolingbroke was rediscovered by historians as a major influence on Voltaire, and on the American patriots John Adams, Thomas Jefferson and James Madison. Adams said that he had read all of Bolingbroke's works at least five times; indeed, Bolingbroke's works were widely read in the American colonies, where they helped provide the foundation for the emerging nation's devotion to republicanism in the United States. His vision of history as cycles of birth, growth, decline and death of a republic was influential in the colonies, as was his contention on liberty: that one is "free not from the law, but by the law". Bute and George III derived their political ideas from The Patriot King. Edmund Burke wrote his Vindication of Natural Society in imitation of Bolingbroke's style, but in refutation of his principles; and in the Reflections on the French Revolution he exclaims, "Who now reads Bolingbroke, who ever read him through?" Burke denied that Bolingbroke's words left "any permanent impression on his mind". Benjamin Disraeli lionized Bolingbroke as the "Founder of Modern Toryism", eradicating its "absurd and odious doctrines", and establishing its mission to subvert "Whig attempts to transform the English Constitution into an oligarchy". The loss of Bolingbroke's great speeches was regretted by William Pitt more than that of the missing books of Livy and Tacitus. By the early 20th century, the writings and career of Bolingbroke would make a weaker impression than they made on contemporaries. He was thought by the author in his biography in A Short Biographical Dictionary of English (1910) to be a man of brilliant and versatile talents, but selfish, insincere and intriguing, defects of character which arguably led to his political ruin; and his writings were described as glittering, artificial and lacking philosophical merit. Philip Chesney Yorke, his biographer in the Encyclopædia Britannica 11th Edition, commented that his abilities were exercised upon ephemeral objects, and not inspired by lasting or universal ideas. Although not a proclaimed atheist himself, Bolingbroke held certain views of opposition to church and theological teachings that may have had influence during the Age of Enlightenment. The atheist antireligious French-German philosopher Baron d'Holbach quotes Bolingbroke in his political work Good Sense, in reference to Bolingbroke's statements against religion. Bolingbroke was especially influential in stating the need and outlining the machinery of a systematic parliamentary opposition. Such an opposition he called a "country party" which he opposed to the court party. Country parties had been formed before, for instance after the king's speech to Parliament in November 1685, but Bolingbroke was the first to state the need for a continual opposition to the government. To his mind the spirit of liberty was threatened by the court party's lust for power. Liberty could only be safeguarded by an opposition party that used "constitutional methods and a legal course of opposition to the excesses of legal and ministerial power…" (On the Idea of a Patriot King p. 117). He instructed the opposition party to "Wrest the power of government, if you can, out of the hands that employed it weakly and wickedly" (On the Spirit of Patriotism p. 42). This work could be done only by a homogeneous party "…because such a party alone will submit to a drudgery of this kind" (On the idea of a Patriot King p. 170). It was not enough to be eager to speak, keen to act. "They who affect to head an opposition ,…, must be equal, at least, to those whom they oppose…" (On the Spirit of Patriotism p. 58). The opposition had to be of a permanent nature to make sure that it would be looked at as a part of daily politics. It had on every occasion to confront the government (On the Spirit of Patriotism p. 61). He considered a party that systematically opposed the government to be more appealing than a party that did so occasionally (On the Spirit of Patriotism pp. 62, 63). This opposition had to prepare itself to control government (On the Spirit of Patriotism p. 61). Lashmore-Davies, Adrian C., ed. "The Correspondence of Henry St. John and Sir William Trumbull, 1698–1710", Eighteenth-Century Life 32, no. 3 (2008), pp. 23–179. Parke, G., ed. The Letters and Correspondence of Henry St John, Lord Viscount Bolingbroke. 4 vols. 1798. Dickinson, H. T., ed. "The Letters of Henry St. John to the Earl of Orrery, 1709–1711" Camden Miscellany, vol. XXVI. Camden Fourth Series. Volume 14 (London: The Royal Historical Society, 1975), pp. 137–199. H. T. Dickinson (ed.). "Letters of Bolingbroke to the Earl of Orrery, 1712–13", Camden Miscellany, Vol. XXXI. Camden Fourth Series. Volume 44 (London: The Royal Historical Society, 1992), pp. 349–371. The works of the late Right Honourable Henry St. John, Lord Viscount Bolingbroke, new ed., Vol. 1 (London, 1809). The works of the late Right Honourable Henry St. John, Lord Viscount Bolingbroke, new ed., Vol. 2 (London, 1809). The works of the late Right Honourable Henry St. John, Lord Viscount Bolingbroke, new ed., Vol. 3 (London, 1809). The works of the late Right Honourable Henry St. John, Lord Viscount Bolingbroke, new ed., Vol. 4 (London, 1809). The works of the late Right Honourable Henry St. John, Lord Viscount Bolingbroke, new ed., Vol. 5 (London, 1809). The works of the late Right Honourable Henry St. John, Lord Viscount Bolingbroke, new ed., Vol. 6 (London, 1809). The works of the late Right Honourable Henry St. John, Lord Viscount Bolingbroke, new ed., Vol. 7 (London, 1809). The works of the late Right Honourable Henry St. John, Lord Viscount Bolingbroke, new ed., Vol. 8 (London, 1809). Jackman, S. W., ed. The Idea of a Patriot King. Indianapolis, 1965. The Works of the Late Right Honorable Henry St. John, Lord Viscount Bolingbroke was first published in March 1754 in five quarto volumes, and it was made popular by its controversial outlooks on religion. A decade later, the highly successful London bookseller Andrew Millar was still selling the Works for a considerable fortune, setting the price at three guineas (or, three pounds three shillings), a clear indication of the importance and value of the text. In a letter to Dr. Cadell in July 1765, Millar wrote "I never sold a Bolingbroke in quarto under 3 guineas...Wren paid so and I can't now alter the price". ^ a b See e.g., Henry St. John Viscount Bolingbroke, "Letters or Essays Addressed to Alexander Pope: Introduction", The Works of Lord Bolingbroke: With a Life, Prepared Expressly for This Edition, Containing Additional Information Relative to His Personal and Public Character, (Philadelphia: Carey and Hart, 1841) Vol 3, pp. 40-64. Also available on Project Gutenberg as "Letter to Alexander Pope" in Letters to Sir William Windham and Mr. Pope. ^ Ruth Mack (2009). Literary Historicity: Literature and Historical Experience in Eighteenth-century Britain. Stanford UP. p. 8. ^ H. T. Dickinson, Bolingbroke (London: Constable, 1970), p. 2. ^ a b c d Yorke 1911, p. 161. ^ Yorke 1911, pp. 161–162. ^ a b c d e f g h i Yorke 1911, pp. 162. ^ Alimento, Antonella. War Trade and Neutrality Europe and the Mediterranean in the seventeenth and eighteenth centuries. FrancoAngeli. ^ Yorke 1911, pp. 162–163. ^ a b c d e f g h Yorke 1911, pp. 163. ^ Lecky, William Edward Harpole (1888). "Volume I, Chapter III". History of England in the XVIIIth Century (With 1877 preface)|format= requires |url= (help) (first ed.). New York:D. Appleton and Company, 1,3, and 5 Bond Street. p. 343. ^ "Henry "Lord Bolingbroke" St John". Find a Grave. Retrieved 23 August 2015. ^ Yorke 1911, pp. 164. ^ Durant, Will and Ariel (1965). The Age of Voltaire. New York: Simon and Schuster. p. 100. ^ Disraeli, Benjamin (1914). Whigs and Whiggism: political writings. Macmillan. pp. 218–220. ^ Cousin 1910, p. 41. ^ "The manuscripts, Letter from Andrew Millar to Dr. Cadell, July 16,1765. See footnote 27". www.millar-project.ed.ac.uk. Retrieved 1 June 2016. Biddle, Sheila. Bolingbroke and Harley (Alfred A. Knopf, Inc., 1974). Dickinson, Harry Thomas. Bolingbroke (1970), scholarly biography. Kramnick, Isaac. Bolingbroke and his circle: the politics of nostalgia in the age of Walpole (Cornell UP, 1992). Mansfield, Harvey C. Statesmanship and party government: A study of Burke and Bolingbroke (U of Chicago Press, 2012). West, Chris. "Bolingbroke, Henry St. John, 1st Viscount (1678–1751)." in The Encyclopedia of Political Thought (2015). This article incorporates text from a publication now in the public domain: Yorke, Philip Chesney (1911). "Bolingbroke, Henry St John, Viscount" . In Chisholm, Hugh (ed.). Encyclopædia Britannica. 4 (11th ed.). Cambridge University Press. pp. 161–164. This article incorporates text from a publication now in the public domain: Cousin, John William (1910). "Bolingbroke, Henry St. John, 1st Viscount". A Short Biographical Dictionary of English Literature. London: J. M. Dent & Sons. pp. 40–41 – via Wikisource. Wikimedia Commons has media related to Henry St John, 1st Viscount Bolingbroke. Adamson, Robert (1878). "Henry St John, Viscount Bolingbroke" . Encyclopædia Britannica. 4 (9th ed.). pp. 4–7. "Archival material relating to Henry St John, 1st Viscount Bolingbroke". UK National Archives. "Henry St. John Bolingbroke". Internet Encyclopedia of Philosophy.